Quick Links: Tankless water heater for outdoor/overland use Ruger LCR 357 MAG. Gun Magnet Mount Alternative Bent wire gun hangers... anyone use them? What type of carry case would you recommend for tactical rifles What Bipod to get?? Discussion in 'Guns & Hunting' started by tacoman101, Oct 2, 2010. nice!!! the new triggers the savages have are pretty sweet. No real rifle experience, I have a hot rodded 10-22 and a Winchester 94 in .357. If you would, post of a picture of the .300 round. Like to see what it looks like. Pretty big bang? Nice rifle tacoman! The Savage's are great rifles, rather underrated. Good luck with it this coming season. I'm going after deer for the first time this season, going with a bow next week but will probably just look for a pig or two, then I hope to take a deer next month with my 700 once rifle season opens. Fletch, .300WM is a large round (and a pretty hefty boom). There is nothing in North America it won't take down. It's also currently in use by LE and military snipers; in military applications it has an effective range of a bit over 1,000 yards. I had the same gun in Stainless. It was a great shooter, but I bought it when I lived in Alaska. Sold it when I moved to Florida. Too much boom for what I needed. Ha, you could say I upgraded to the .243 from the .300winmag. Thanks for posting that picture. 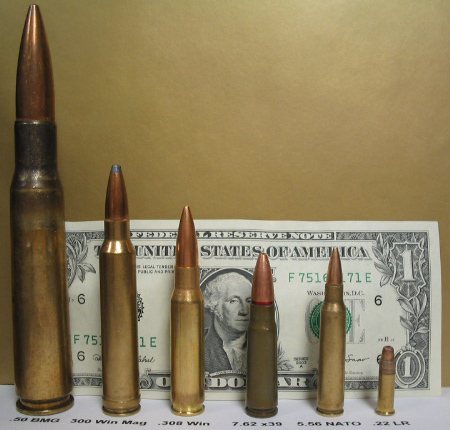 Great image for reference, the .50 really dwarfs the .22. Huge case on that .300. Winchester factory loads for the .300 Winchester Magnum give a 150 grain Power Point bullet a MV of 3290 fps and ME of 3605 ft. lbs. At 200 yards the figures are 2636 fps and 2314 ft. lbs. A 165 grain bullet is probably a better choice for the .300 Win. Mag., given the powder capacity of the case and the superior sectional density (SD) of the heavier bullet. Winchester's factory load gives a 165 grain Fail Safe bullet a MV of 3120 fps and ME of 3567 ft. lbs. At 200 yards the figures are 2515 fps and 2319 ft. lbs. The trajectory of a 165 grain spitzer bullet at a MV of 3120 fps should look about like this: +3" at 100 yards, +3.4" at 200 yards, -1.2" at 300 yards, and -11.4" at 400 yards. 180 grains is the most popular bullet weight for all of the .300 Mags. Winchester loads their 180 grain Power Point Plus bullet to a MV of 3070 fps. and ME of 3,768 ft. lbs. At 200 yards the velocity is 2633 fps and the remaining energy is 2361 ft. lbs. Cool, now go kill something! And of course eat it when you are done! The only round in that picture that won't do > 3000 fps is .22LR (though doing so with 7.62x39 would require a custom load and a 20"+ barrel). The real impressive number is the 2300+ ft.lbs of energy that it hits with. That's nearly three times the energy of .44MAG *at* the muzzle. Big jump from a 243 to a 300 Mag. Glad you love the kick, as I'm sure it is considerably more than the 243. Plenty of deer in VT, they're just smarter than me, is all. Good luck with the new Savage. There was 20 inches of new snow dumped in the mtns yesterday, chill in the air today, neighbors and my nephew are off moose hunting. Trying not to get too excited, or I won't sleep at night until after Thanksgiving. Nice! I just picked up a Savage 111 in 7mm Mag...almost got it sighted in completely yesterday. Gotta love the kick. Meaning kick or lack of? Don't know what to compare the 7mm Mag to, but I hear it is a GREAT hunting round. I had an old 110L for a lot of years in .308. It kicked like a mule but was a good shooter. I'm lefty and picked it up from a friend for $100. I hear the newer Savages are as smooth as silk. Ha oh no it's got quite a kick. More than a .308 or .30-06. I've heard it's a great hunting round as well.